Infoflo is an easy to use CRM that is perfect for managing relationships with your customers and contacts. It is a fully integrated contact, relationship, email, calendar, document & task management solution. One time, up front cost, no subscriptions and our data resides on our server. If you need additional functionality you simply purchase the module and move on. We have really liked the ability to create our own templates for Professional Reports and proposals and have the information in InfoFlo automatically fill in our fields as needed. It is great at the end of the year being able to create custom reports that detail any information we would like to know about our projects, clients, etc. We have used this software for the past two years and have had minimal issues. Most of our problems were solved using the Knowledge Base on InfoFlo's website. There are parts of the CRM solution that we have tried implementing into our process, but for one reason or another don't use it. It would be nice to be able to turn certain portions of the software off to simplify the screen with what we use. We looked at many other solutions and this fit our business perfectly. We were able to customize it to what we needed and we purchased the modules that help us the most. We love InfoFlo and will continue using them and recommending them. Easy weekly reports of current projects. Easy end of year reports detailing any attributes about our projects we would like to know. Information is readily available and easy to input into the database. We have created our proposal templates and tied them into InfoFlo so contact information automatically populates where we need it. "Very easy to use, good value for the price, and with most of the needed functionality"
The support is really fast and highly motivated to help with problems and bug fixes. There is not much to say, because InfoFlo is a great piece of software. Only the Outlook synchronization plug-in seems to have some small problems with using Outlook versions in another language (German). What is strongly missing is the possibility to input the department of a contact. Dealing with large companies or universities with many departments, this is valuable information and needs to be synchronized with outlook as well. A feature request is filed and hopefully this will be implemented soon. Download test version and try which addon you need. Many addons are available. We need to keep customer related information, documents, e-mails and tasks in one place accessible for all the team members. The data is stored in a SQL database on a server in the cloud, so that home office use is possible with a good performance. "Does the job intended, simple to use and highly reliable synchronization routines"
We needed to desperately integrate a simple to use but powerful CMS system but also knew that because of our unique workflow – we would need heavy customization for any system. Cost would also be a factor, so that is when I choose InfoFlo. Also as mentioned in dislike below - they listen to comments and will make changes to suit a larger customer base. The software could have more configuration options that appeal to a wider base - for instance a Task notification that is based on choice of 'due' date rather than 'start' date. Marcus & Pollack LLP (M & P) is a law firm whose principal areas of concentration involve Real Estate Tax Review and Litigation (Tax Certiorari), commercial and residential tax exemptions and abatements, Condemnation, tax planning and other areas of Municipal and State law in New York City. system is used to view property data such as block and lot, street address, land and building size, tax class, tax abatement information, sales data, income & expense figures and hundreds of other facts stored in a SQL database – but was not a CMS or could be used as a controlled repository. That is where InfoFlo came in. All Properties and their relationship with the Client/ClientID needed to be synchronized from the CliPAD database into InfoFlo. The CliPAD database would act as the main collection of valuable property & related client data. 1. InfoFlo would synchronize any change to Property or Client metadata as well as the Property to ClientID relationship, etc from CliPAD to InfoFlo within one minute. 2. All related emails tagged in Outlook with a unique Property-ClientID code would automatically brought into the InfoFlo database. Anyone in the company (over 30 employees) could find out if an email was received or sent based on a specific property and/or ClientID in an instant without having to go to a particular users email InBox. 3. We also had InfoFlo develop a ‘Hot Folder’ configuration so when our QR codes (another implementation developed using ‘ecopy’ to read an embedded QR code within a document that included the unique Property-ClientID and named the file such – would be saved into the Hot Folder – InfoFlo would read the unique code and automatically ingest it into the InfoFlo Document Depot under the correct property saving thousands of manual people hours. 4. A new Phase 1 completed again without a flaw in the synchronizing routine which synchronizes the same ClientID – Property relationship from CliPAD/InfoFlo to QuickBooks Premier. This is a major improvement over our bookkeeper using our existing FoxPro customized database. "Custom development is buggy and customer service is lacking"
Custom development is very buggy. Bug fixes introduced by custom work are not guaranteed like bug fixes from the out of box product. Just about every mainstream update and update for custom work has introduced new bugs to custom and out of the box functionality. Customer service and account management is lacking. Recent interactions with their owner have left me extremely disappointed. Paid 10 hours of support upfront this year at a discounted rate, but owner recently got involved and told me it was a mistake to offer the option for us and he wanted to credit us the original amount and then bill us time and materials instead. Also recent discussions with the owner on how to handle upgrades contradict previous agreements with Account Team. If looking for out of box functionality then you are probably ok. But don't waste your time and money if you require or value custom development. No matter what they promise you in pre-sales. CRM, Events and Mail List management. We always put our customers first and strive to go above and beyond their expectations. We have worked with this customer for almost 3 years and tried our best to be reasonable and accommodate his every request going as far as taking a loss on the project. "Easy to use CRM database"
I love that there's only a one time fee and that I add on features as I need them. I also love the simplicity of the design and that my information stays in my possession. I've tried samples of other CRM software. The complication of those is above my needs and so complicated to set up that I end up not using them. I've used Infoflo for several months and only love it more and more. The biggest thing I dislike is my own issue. I need to upgrade the RAM on my computer because it slows everything down when it is running. I like to keep it open in the background so I can switch back and forth easily, but it uses up a lot of my computer's processing power. I knew when I purchased this computer that it was light on RAM and I would need to upgrade it at some point. Now is the time! I love using this software. I recommend trying out the wonderful free trial, then start adding in extra features as you find that you need them. Once I've found that I have additional needs, they already have a solution ready for me to implement! Keeping track of my client information and sales cycles. I'm still only using a very small portion of what the database is capable of, but I have one place where I can store client and prospect info and add fields and notes. I have been using InfoFlow very extensively now for 3 days. The email integration is very powerful. Document management is also a strong feature. Had been using Maximizer Entrepreneur Version 12 which is no longer supported. Maximizer 12 had a feature where it would inherit the company address and phone numbers into the contacts window. InfoFlow does not offer this feature. Means a lot of duplicate typing of the same information. InfoFlow tells me that they could be offering this feature shortly in an upgrade. Spend the time to learn how to use all the features properly. Has allowed for the effective management many e-mails and other information. "Easy to customize, Easy to Use, Great for Business!" I highly recommend this software to any business that needs all on their customer and sales information in one place that is easy to access and use. I love that the price is a an upfront cost without hidden fees or a monthly contract. The staff is incredibly helpful and knowledgeable. Connecting to your CRM is easy and easy to customize. I think every small and large business needs a software exactly like this. Infoflo has solved out customer management issues greatly! Our company has multiple employees that work remotely and other CRMs was not as easy to connect to as Infoflo. The reporting tool and phone pbx system that integrates with Infoflo has made our jobs easier and productivity increase. It was easy to use and easy to integrate in everyday use. I highly recommend Infoflo! "Finally!! A great, simple, reasonably priced but powerful to use CRM for use with Outlook"
I have tried close to 10 CRM . Most are geared toward companies with 10 plus employees in multiple departments. I needed one for me that would help me manage my 7 work, volunteer, and personal domains and email. This is the first one where I can manage everything including in a single calendar and over 1,000 contacts. So simple to figure out. I needed some help with the email sync but Shai fixed it quickly and also recommended ways to speed performance and my productivity! AWESOME! In setting up a new contact from a client's email, the default company name is the email address extension. This needs to be cleared before saving. Very minor problem but it would be preferable that the company name be left blank. I could either select from an existing account or add a new one in the blank line. Very minor problem. Take advantage of the 30 free trial and upload your emails. So easy to use, I signed up in 1 week. I want to manage my multiple businesses in a single CRM and database. but email using separate signatures for the business specific domain. This is the first CRM I could find that could do this key feature I need. "Extremely efficient and easy to understand software with outstanding customer service"
The Employees behind this software respond immediately to your questions/concerns. "Early Impressions of using InfoFlo CRM and Project Management"
I am a previous user of Goldmine CRM and Saleslogix so those are my reference points. The price is affordable for an individual, small business or mid-size business. All the basic functionality seems to be there. The system is modular so you can purchase the modules or functionality you need. One time purchase includes future updates, not a subscription. One of the few CRM systems with a Project Management module included. The Project Management module was a deciding factor. My needs included keeping up with companies, contacts, activities, schedules and monitoring projects. Additionally use it for sales and opportunity management. The interface is clean and easy to navigate. There is some basic customization capability. You can create a "template" that populates the task based on the type of new Project when a new project is created. Great feature. I like having a History Tab to keeps up with all completed activities; calls, meetings, task, projects, sales, etc. I miss not having a specific place to look at completed activity for a customer of company. There is limited customization available from the settings. You can create additional fields / custom fields, you can create task types, status, priority, etc. You can change the field labels to better fit you organization. While not highly customizable the basic system is very flexible and meets my needs. Key dislike is that the documentation is limited. There is a knowledge base online but not a "user manual"
When updates are provided there is no way to find what is included, the update page is very out dated. Download the trial and test it for your particular needs. Make a list of the additional modules you will need so you have a true cost of the software. The company is very helpful in a presales environment and provided me with a demo and answered questions. I choose to schedule the demo after I had some experience with the trial. I imported contacts and companies from Excel spreadsheets. It was simple and I was able to to it myself. If you needs are more complex the company can assist you in bring in data from a previous system. "Fantastic and affordable software for communicating with work colleagues on a daily basis"
I work in at a satellite office for my company and I am in constant need of communicating with others in various offices throughout the state of Florida. This software helps keep my daily activities, business projects, business contacts, and companies all in one place. In addition, I can share my data with work colleagues on a daily basis. We are able to share calendars, tasks, projects, and contacts without having to pickup the phone, text, or email each other every day. This helps us organize our respective locations and not overwhelm another college with information that may not be important to them. All of us are doing business in different markets and we need to keep our Outlook inboxes and calendars for our local areas. However, we still need to communicate with one another and this software enables us to do just that. I have not complaints about this software. I does everything I need to do without having to pay a monthly fee. I would recommend this software to any marketing firm or business that needs to keep track of their employee's daily activities and does not want to pay a large sum of money to accomplish that goal. In addition, this software streamlines to process of data entry. When one user enters a contact or company it is there. There is no need to search through spreadsheets or call a colleague every time you need an address or email address of someone. One of the great problems that I have been able to eliminate with this software is to organize my contacts. Previously, my Outlook and phone were cluttered with contacts and it made it extremely difficult to distinguish and find vendors, business associates, or customers. With the help of the InfoFlo category system and the Google Sync add on I am able to separate all of my contacts and organize them. "A Great CRM - smart and simple, but everything you need"
It is incredibly user friendly. Updating and customizing the system to meet your needs is simple and easy. It incorporates all of the necessities of a CRM without over complicating it. I have worked with a lot of CRM's and can easily describe what I dislike about all of them. I've used InfoFlo for almost a month now and haven't yet found anything that I dislike. If you want a comprehensive CRM that is simple to set-up and use, InfoFlo is for you. It meets all of my needs and integrates so smoothly with my day to day activities. I need a CRM to track clients, interactions, sales process, etc. but I also spend the majority of my office time on Outlook . The beauty of InfoFlo is that it feels like an extension of Outlook whereas other CRM's feel like Outlook is a connected application. With InfoFlo I use one system, that's it. The Task tab does not bring up the contacts phone number without secondarily bringing up the summary page. If your familiar with CRM's or even if your not, take advantage of the 30 trial. It gives you ample time to get acquainted with all its features. I'm in a retail environment. Sorting between the casual shopper and a potential buyer can be difficult. InfoFlo makes this a breeze through the task feature. I can continue to update the task date for continued dialog with the customer until the sale is achieved. "Very pleased with features and functionality"
I like that after years of using other crms this was ready to go out of the box. No heavy customization to get what you need the way you need it. The support team and user interface are my two biggest pros on infoflo. Form follows functions and this is extremely functional. I suppose other crms may be more hip and fresh on the interface, i just wanted a simple clean practical crm software. It's moving my business notes, product mix, docs, emails, photos in to a software and out of my brain to free up my mind for the bigger picture, more sales! InfoFlo is an affordable full function CRM system that allows me to manage all aspects of my lead management and customer communication. The User Interface is outstanding, and I was able to get up and running very easily. My contacts are segmented across multiple business lines, and I can further segment contacts into various categories. This allows me to be very effective and targeted in identifying and communicating with those customers and/or leads that require my attention. The application is also fully integrated with outlook, which allows me to continue to use those outlook functions that I have grown attached to... without issue. There is nothing about the software application that I dislike. I am able to track and manage a high volume of leads. Execute targeted bulk email. Track and manage my contacts and associated communication by property (I am in the Real Estate business). Tasks are captured so nothing slips through the cracks. Leads/inquiries are segmented by properties for improved communication with the leads themselves, tenants and Realtor clients. "Best CRM for small business"
I own a small manufactures rep business and i am not a fan of having to carry all my files for all the projects that i am working on with me. With Infoflo i can link all the emails, notes, documents and contacts associates with the project and have it all in one place instead of having to search all over my computer for it. Also the staff are very knowledgeable and willing to help at any time, which is great since i am not a computer expert. Would be nice to add additional information to the sales/opportunities section like multiple documents and emails, but other than that it is a great product. If you are a small business owner looking for an intuitive CRM software that is easy to install and delivers what it promises then this is the one for CRM for you. Great work Infoflo team. The business problem i am trying to solve is having all my information for a project ready available in one area. I am now able to call the client and open up past notes, emails, documents, discussions and any other information on the project i need at a click of a but. The benefit is not wasting my clients or my time searching for information during a call or meeting. Simple and intuitive. Syncs with Outlook. Very cost effective. Get the trail copy and give it a try. Very easy to use and does what you need. As a commercial loan broker I needed a system to track my leads and active deals. Ability to see stage of deal, attach notes, follow up tasks and general manage this information. Benefits have been getting rid of all the scraps of paper and reminders and time savings due to organizing and automating these CRM processes. "Build to suit your business"
The way the InfoFlo connects and communicates with other programs creates many efficiencies that we would not otherwise have. Everyday our team seems to find new way to utilize the functions within InfoFlo and helps us all to do better do our jobs and communicate large amounts of customer and product information across the company. The service and support we have received has been top level and invaluable to the success in implementing the system. The best part for us is that we continue to grow and evolve as a company the system can grow and evolve with us. The lack of a Mac specific program (despite work around available) can be annoying and we look forward to the release of a mobile version of the program. The trial does not do the system justice. When you are able to get into the system and set it up to mirror your business you will unlock a lot of the potential for InfoFlo. InfoFlo has been a huge help for our company as we continue to grow. Having the ability to customize and use the system in a way that best fits our business makes it feel like the system was custom built for us. The layout and functionality of the system makes it very easy to use and very easy to understand and navigate, even for our team members who are highly tech savvy. "InfoFlo is central to our practice management and delivery of excellent customer service"
The price is very competitive and their "one time purchase" policy with updates for life along with the ability to purchase additional modules as needed is ideally suited to a growing practice like ours. Additionally the integration with Outlook is a greatly appreciated feature. InfoFlo has proven to be highly customizable while being user friendly. We were pleased with the extent to which we can customize the software to the specific needs of each team member. As far as pre sales and after sales support, Shai and Eran have been extremely knowledgeable and helpful. We have been using InfoFlo for over a year and so far this is nothing to dislike. At this moment, the software does not have a mobile component with offline client contact and calendar data which would allow us to replace another application from another vendor that we currently have to use for our travelling staff. InfoFlo allows us to organize and maintain up to date client and prospect data, tasks and accounting information as well as manage and assess our in house processes. Additionally we have seen an improvement in our customer service levels. Due to InfoFlo’s integrated approach we have noted a significant reduction in time spent searching for emails, documents and other information related to clients. Now thanks to InfoFlo we have an almost paperless office. "Very good user friendly software, does exactly what you expect of CRM software"
Easy to use does what it is supposed to. Just purchased InfoFlo last week and have it up and running all of my previous CRM data. Once you figure out the import features using the company and categories features it is awesome. I need to give a special thanks to Shai B. for all his help. He ensured InfoFlo would meet all my needs prior to purchasing the software and he was right. This one time purchase will same me over $1200 each year. Thank you SIR! Learning a new system. Not really an application dislike. If you are looking for a easy to use application for tracking your prospects as well as clients and policies, this application is great. I was able to use this software not only for CRM prospecting, but policy management as well for my Life/Health Business. Most importantly, I am able to organize my client data. I am an old school guy that likes having my data on my PC. The cloud is fine, but if you have internet issues, you are out of luck. I live in a small market and internet issues are the norm. If you want to access your data while you on are the road, they offer a module for this as well. I can't wait tell they add a module that calls my clients, sets the appointment and writes the business.................! "InfoFlo Exactly what we were looking for." Ease of use. Easy to set up, flexible, no need for coders on staff. We liked this product as it fit our needs on our budget. Would get more flexibility with more complicated software. We had to take a few short cuts to get it to work the way we wanted. Consolidated customer lists, adding task management to our day to day. Everything is so much more efficient then before. "been searching to replace ms business contact manager"
infoflo crm offers seamless integration with outlook ..a big plus compared to most of the web based solutions out there. Very rich in features and can purchase the wide variety of modules as needed. The learning curve is short and the folks at Carmel are very eager to help with set up and post installation issues or questions. The price is very competitive and their "one time purchase" policy is a rarity in the industry along with updates for life. Shai is the best..very helpful. they should have a reasonably priced annual subscription which would cover updates and software support. they should have cloud access along with on premise. as an independent manufacturers rep. this software helps to organize clients, tasks, project management and follow ups. great display when on the phone with a client...all information is at your finger tips and the search engine is fast. InfoFlo is really simple to use and provides a capability I had not found in other CRMs I have reviewed. I like the idea that it is not a monthly fee base CRM. As a small business, the monthly fee for many CRMs while reasonable for some others are expensive and this never stops. InfoFlo, you size what you need with the Add-Ons. I needed some help in how my emails were being displayed or not displayed. I had missed an important point about how emails are brought into InfoFlo by first populating the contact if it is unknown. Shai Berliner was most excellent in helping me. InfoFlo videos do show you the proper method. I am one of those Engineers who never look at a manual to run something and this was the problem of not knowing how to populate a contact to bring new emails for that contact into Infoflo. I am very big on Customer service and InfoFlo has provide excellent support. I highly recommend them for a best value CRM for small business. I wish that the software was linked better with QuickBooks. I will be looking forward to more integration with QuickBooks in the future. information request overload from sales inquiries to technical support. Pretty much everything so far. Its designed in an intuitive way that allows you to navigate the program easily. In my business its essential to be able to collect, store and manage a ton of information. I dont have time to be searching for a piece of information from last quarter for instance that will make the difference of me winning the business or not. Infoflo makes it easy to manage hundreds of accounts and their activity. Also, the customer service has been great! Nothing yet. I supposed I have spent a lot of time figuring out how to do particular functions. But the customer service is great and so far they have helped me get to know my CRM and take advantage of its features. I would definitely recommend this program to anybody looking to invest in a CRM. Its easy to use, has everything I need and not having to subscribe and pay on a monthly basis was a big factor for me. Also, these CRM programs are huge and there can be a significant learning curve. InfoFlo's great customer service has helped speed up this learning curve. I am solving the issue of trying to keep track of a large number of accounts and a huge amount of information over long periods of time. Infoflo makes that easy. I only purchased this a couple of days ago but the benefits I will be receiving from this product are obvious. It quite simply does everything I need in an easy to use way. Systematically I am looking for CRM software, which would be free or pay one-time charge. Free version stand out as being incomplete or too restrictive for normal use. Then I found InfoFlo and download the trial version and immediately saw that this is the right thing for us. Trial version is full, so that they can peacefully find out what additional modules you need. The price for the basic version is really very low, with additional modules, the price can be much higher, but it is a one-time payment and free upgrades. The staff is very friendly and willing to help. Software is stable and works flawlessly highly recommend it as a good investment. - There is no instruction manual in pdf, only the knowledge base, which explains only the essential things. - Updates are very frequent and do not explain what they actually update. - There is no direct connection to Office 365 Exchange Online, just over the outlook connector. - Licensing of additional modules is sometimes muddy, such as for automatic backup you need to buy as many licenses as users, which can be a very simple function formed a significant cost. Finally, we have all the data, e-mails and phone numbers of customers and suppliers organized and in one place. Additional acquisitions were almost all of the additional modules which are very useful. With infoflo save a lot of time, which was previously used to search folders and Outlook. "Finally found a CRM that works within our organization"
Most CRMs seem to require you to revamp your firm's workflow to accommodate their system. With InfoFlo, we were able to customize it to work within our desired flow. When exporting reports to Excel the output needs to be manipulated into a reader friendly report but if you are comfortable with Excel, it is not a big deal. Reduce firm risk of having certain institutional knowledge with only the relationship manager, improve information sharing with the administrative staff. "Infoflo allows our business to keep up with open jobs." We use the stages, appointments, and emails more than anything I think. It all helps us stay on track so that we don't get behind or let a customer fall between the cracks. There was a few bugs to begin with and we ended up having to start over but since then it seems to be working great! We sell Chiropractic equipment. The software helps us keep track of all the customer information and open orders. We have stages listed for when we send estimates, when we are waiting on payment, when we need to build the tables, when the tables ship, and a follow up stage to see how the customer likes the tables. It helps us keep track of everything so that we don not lose someone and so that we get the tables built in a timely manner. The fact that we can make an appointment to pop up as a reminder helps a lot. It's great that everyone can see all the customer emails whether you sent it originally or not. That lets us help the customers if they call in without having to ask the original sender. "InfoFlo is an Integral Part of our Business"
The learning curve for InfoFlo is short which is a big plus when training new sales reps yet it is big on benefits and usability. On the top of my wish list for InfoFlo is more robust options for the admin. Great American Publishers uses InfoFlo in both our sales & production departments. In sales, InfoFlo servers as our CRM/Database Manager and does a terrific job providing our sales reps with all the tools they need for effectively managing their customer list and call backs. InfoFlo also provides our Director with the tools she needs to evaluate calls and sales effort for each rep. In Production, we use InfoFlo's Project Management add-on to effectively manage each cookbook through the full production phase utilizing Tasks to assign and control workflow. We also love the Email Marketing add-on. "Finally someone used their brain!" To have everything on one screen, to be able to connect a client with thier emails and company and sales its is just amazing. Have not found one yet. But there seem to be a bug or two in the software which requires re-booting every once in a while. Just like learning a new language, you need to stick with it and once you get over the initial stage of the learning the software ( which was less than a day for me) then you see how easy everything will become. You feel you are finally in control of your business! We are now completely paper free. We are able to pick up the phone and have all the details of a client in front of us, I think the clients are feeling the difference as well. 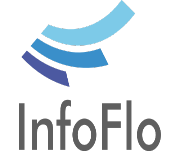 InfoFlo is a valuable information organization solution, with additional add-on services available. We opted for the reporting function, which has made it easy to provide clients with feedback, as well as creating customizable reports for our own billing purposes. Our business has integrated InfoFlo as the fundamental software for our day-to-day workflow and communications. Infoflo allows our business to stay up-to-date on client information, correspondence and documents. The software is user friendly and sync’s with Microsoft Outlook, allowing our entire company easy access to the same information. The ability to customize sync times means there is little to no delay in refreshing new information. Updates/Changes made to an account are instantly viewable company-wide. The seamless communication InfoFlo provides has saved us time and & cut out confusion. InfoFlo has proven to be highly customizable while remaining user friendly. We were pleased to the extent of which we can customize the software to our specific needs. The customer support we have received since utilizing this software has been attentive, knowledgeable and friendly. InfoFlo has been a essential tool in keeping our accounts organized and our business running smoothly. How fair the pricing is. The monthly fees from other companies are quite high and get you nothing. I haven't found anything that I dislike yet. It was just too easy. Take the 30 day trial as it is so easy to understand and use. Keeping our small sales office on the same page. "InfoFlo helps us keep our contacts organized"
InfoFlo is easy to customize and we have been able to buy add-ons as needed to increase it's usefulness. I like that I can create as many categories as I need to group different contacts together and search for them later based on very specific search terms. InfoFlo can be a little bit different to get use to - importing contacts has to be done is a very specific way. Training from InfoFlo was very helpful on this front. Keeping contacts organized for PR outreach activities and sending mass emails to similar writers on specific topics. We are better able to track who we've talked to recently and follow through on connecting with individuals we may have not heard from in a while. Product is highly customizable so I can customize to fit the needs of my business. When linking to email folders, the program requires one to check every subfolder to link rather than adding all subfolders automatically beneath a selected folder. InfoFlo allows me to centralize my contacts and projects in one area. Inexpensive, extensible. There are no subscription fees. You purchase what you need as you need it. Not Mac compatible. Loses connection to server regularly. Initialization after updates can be frustrating. This is not a FINRA compliant CRM. If you're in financial services, you'll need to investigate another tool. Also, when you're using the trial version, understand that the features included are more than just the core product. If you do the trial and then purchase the software, you may lose features you had with the trial version if you don't purchase other components. Do take advantage of the guided tour. Seeing the features implemented by a knowledgeable person is very helpful in developing an implementation strategy. Infoflo is very intuitive and as a result very easy to use. I run a small executive search firm and the level of functionality of the database suits my business needs perfectly. The add on products are relevant and again, very easy to install and use. The one off price is very reasonable as is the price of the add on products. I have been very impressed by the customer service of Carmel Vision . I had some questions when first using the system and Shai Berliner , an account manager at Carmel Vision has been really helpful. I would not hesitate in recommending Infoflo. I have been using Infoflo for only a month and thus far I have not discovered anything that I dislike about the system. "Easy To Use, Manage and Extend"
the only thing i can honestly say i disliked was the fact that Carmel vision are based in Canada, as we are UK based so if anything where to go wrong we would have to wait till late afternoon to fix this. but this has not really been an issue at all!! Loss of data was a huge issue for us, now we can keep track of all our data with very little worries. it also helps keep our staff organised, since the installation of infoflo, our call rates have gone through the roof!. when it comes to our sales pipelines infoflo has kept everything in one place for us now, instead of having to go back and forth between different programs infoflo has made our lives much easier and much more organised. Another great feature is the email syncing, now we can truly prioritize our emails, lets face it clients come first! "We use InfoFlo for our main workflow/operational process/BI functions"
Ease of use! It is an extraordinarily intuitive User Interface, which allows us to get new employees up to speed and productive in a very fast manner. SUPPORT - CarmelVision has been exceptional, both in terms of normal day-in/day-out operational support, but more importantly, when we have critical business/production issues, they help us resume normal operation, normally within a couple of hours! I've never heard of commercial software with this kind of support. really nothing about current content, rather what would be missing. It would be nice to have a form of automated workflow, i.e. having the creation of a certain type of document create a task for a particular employee, without the manual tasking. Work process automation. This tracks all of our information , clients, and providers, and allows us to facilitate our billing and followup. "Impressive capabilities in a low cost CRM software"
Enormous deal of media contacts can be handled and get reports with a single click. Clicking a contact gives you all the details and history from a variety of lists. Not to mention that the price is extremely low and you can get only the add-on goodies that you need. If you need an easy to use yet powerfull CRM software you have to try it out! I can handle my database and arrange my mailing lists in an efficient way while I can receive reports and inspect whatever I wish fast and easy. "Can't Run Our Company Without InfoFlo"
This software program has changed everything in our office. Our contact management is so much easier to keep track of, and with email integration, it makes our life so much easier and helps with time management. I highly reccomend InfoFlo to small and large businesses becuase the sky is the limit. I highly recommend InfoFlo Software because of the ease of use and versatility of the program. "Amazing Product- Makes work much more efficient "
More particularly, a very effective system for a law firm like mine. Everything is amazing that there's nothing negative with the software. It actually makes working much faster and very user-friendly. "Simple to Use - but Effective"
This CRM is very user friendly - easy to set up and intuitive to use. The relationship feature between Contact and Company is handy. The custom fields features are nice, complete with check boxes. I like the pricing model where we can buy the core and add only what we need. So far, I have not found anything that I dislike about InfoFlo. Use company policies to create data protocols for use in the CRM. This will help keep data consistent from record to record. Tracking data for clients, prospects, and support activities. InfoFlo reduced our admin time to setup and service each client in our system. "Very good and affordable sales contact database. Easy to use and quick to respond." Searches for individual contacts and companies and groups is quick and easy. Also, I like the onhe time charge because I do not like to get charged every month for a subscription. Every additional function is a add on and it cost extra. But if you do not really need them, you do not have to purchase. A better search engine should have been included in the basic product offering though. Do not let sales leads and prospects fall through the cracks. The interface is good, easy to use, and very straight forward. Customization is available, but limited. Contact management to keep track of records that vary from sales to notes regarding specific instructions for each client. "Intuitive and cost effective with great integration"
It's easy to use interface cuts down on the learning curve of a new system. They have great videos to go along with every feature. Easily integrate with Gmail and Outlook users. No subscription or annual maintenance fees. Nothing so far. The experience with InfoFlo has been a pleasant one. Sales cycle, easily finding information, marketing. "Easy to install and quick to get started with"
This software is a good, stable and very affordable CRM. It has a couple of features that I would consider essential: integration with Outlook and the possibility to install on our own servers rather than the cloud. Getting the basics down is very quick, and the website provides a series of tutorial videos which are quite good for getting started. Add-ons provide a good way to extend the product and tailor it to your needs without over-paying for features you never use. Lastly, the developers are responsive and provide quite informative, and very friendly, support. The website has a 'chat' feature as well as a ticketing system for more detailed requests. The Opportunities section is slightly limited, and the Dashboard still needs some improvement to become truly useful. Also, sometimes tasks seem to get stuck in the dashboard view even after they have been marked as complete. Check carefully which add-ons you may need. We ended up with the Reporting, Outlook and Project additions. The trial edition lets you test them all - make a lot of use of the trial time so you can be sure which ones are essential. We are using this as a CRM in its most literal sense. Being able to login from any PC and share our customer data through the company has been a huge benefit. Secondly, Outlook integration means I can get and set appointments from anywhere and have them mirrored in my Exchange and my InfoFlo calendars seamlessly. "One of the best CRM software"
A few more features can be added to the incoming emails - an icon for replied, forwarded emails. Also saving a draft email should be a must, Many times a long email to a client is completed over a few days. "One stop info and follow up clients"
I was looking for a software where I could have all my clients names and adress, company etc but most something that could also link their info with their social medias AND pictures. Why pictures, because my business is about working with women's posture and presentation. And I needed to be able to recognise them the minute I would receive an email from them, in order to so good follow up. InfoFlo just responded exactly what I needed! A bit difficult to personalise the looks of the emails. "One of the best tools I have tried for organizing information"
I love the ability to attach any kind of document or email to a specific contact. Another great feature is the ability to see all the history of all communications with specific contacts. Learning to navigate the program is not as intuitive as I would like. This is a very good, financially affordable solution for small businesses. 3. Accessing the history of all communications with my contacts. The benefits are that I am more efficient, using less time to find information. Here at Kasper Insurance Agency we have been using InfoFlo for the last 6 months. I really appreciated the sales process where we were able to try the product before purchasing. The representative went way beyond normal efforts to answer my question. There was no high pressure in his presentation. We just recently had an issue with Windows 8.1 and after purchasing the tech support they fixed my problem in a very timely manner. I really can't express the appreciation for all there effort. I really have no dislikes at this point. One of the main benefits is having one calendar for all of our agent in one place. This has really helped us manage our appointments as an agency. * We monitor all InfoFlo Software reviews to prevent fraudulent reviews and keep review quality high. We do not post reviews by company employees or direct competitors. Validated reviews require the user to submit a screenshot of the product containing their user ID, in order to verify a user is an actual user of the product. Hi there! Are you looking to implement a solution like InfoFlo?